The Cane Corso (also referred to as Italian Mastiff) originated in Italy as a loyal guard dog and excellent hunter. Being a very strong breed with a protective nature, many owners choose tough military related names. In fact, the breed is thought to have descended directly from Canis Pugnax (a breed used in ancient Roman military). Tank, Panzer, and Sergeant are a few examples that are popular among Corsi. With an Italian origin, it is not at all uncommon for a Cane Corso to carry an Italian name. Many choose the names of famous Italian historical figures or Italian-American mobsters. Capone and Lucky are popular mobster choices. As with any sizeable dog, names of powerful heroes and sports figures are prominent. Tyson, Hulk, and Goliath are just a few names that fit the bill. You will notice a few themes that carry throughout the names on the list. Most of them are strong, powerful, and commanding. These fit well on a breed that is often sought after as home protectors. Enjoy this mythological list of dog names. Apollo The son of Jupiter. Apollo is god of music and poetry. Ceres Roman goddess of fertility and agriculture. Ceres is one of the twelve major Roman deities. Diana The daughter of Jupiter and twin sister of Apollo. Diana is the Roman goddess of nature. She has the power to talk to and control animals. Janus The Roman god of transitions and time. He is usually shown having two faces. One looks to the future and the other to the past. Juno A Roman goddes that serves as protector of the state. She looks after all the women of Rome. Jupiter The Roman god of the sky and thunder. He is the ruler of the gods. Liber The Roman god of wine and freedom. He is also referred to as Liber Pater which means 'the free father'. Luna The Roman goddess of the moon. She is the female complement of the sun god 'Sol'. Mars Roman god of war and guardian of agriculture. He is the prominent of the Roman military gods. Mercury The Roman god of commerce and finances. He also guides souls to the underworld. Minerva The Roman goddess of strategy and wisdom. Neptune The Roman god of the sea and horses. He is depicted as riding on a seashorse drawn chariot. Orcus Roman god of the underworld. He is depicted as a hairy giant. Saturn Roman god of religion and time. The first god of the Capitol. He is father to Jupiter, Neptune, Pluto, Juno, Ceres and Vesta. Sol The Roman god of the sun. Terra The Roman goddess of earth. She is often depicted as laying and is seen with the sky god. Vesta The Roman goddess of family and home. She is symbolized by sacred fire burning at her temples. Vulcan The Roman god of fire. He is often shown wielding a blacksmith's hammer. Why it's a cane corso name? Didn't find the strong name you were looking for? Try our manly dog names page. The Cane Corso is a historical hunter. You might want to check out the hunting dog names. What color coat does your dog have? Here are some names by color. Do you own a Cane Corso? Snap a picture really quick and submit it below. Here are a collection of photos from other visitors. Some of our pages will contain a subcategory. A subcategory is a slightly more specific grouping than the main topic of the page. For a subcategory, we will include a separated table of names and corresponding descriptions. An example of a subcategory of Red Dog Names would be 'Dog Names Inspired by Red Wines'. 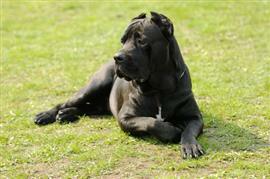 If you have any subcategory ideas for the Cane Corso Names page, we would love to hear them. Use the form below to submit your ideas. Would like you to share your own Cane Corso name ideas? Let us know which names you recommend and why. Here are a few ideas that others have submitted.